High welfare standards benefit the individual horse as well as the whole thoroughbred racing industry. Horse welfare and peak performance are closely connected. To gain or retain the public’s acceptance of racing as a sport and industry, is it important to be honest and open about welfare issues in order to evaluate them and to develop strategies to minimise recognised problems. Education and training of trainers, breeding staff, jockeys and stablehands. Government-mandated welfare laws and regulations also apply, and a horse’s welfare is the responsibility of the owner or person in charge. 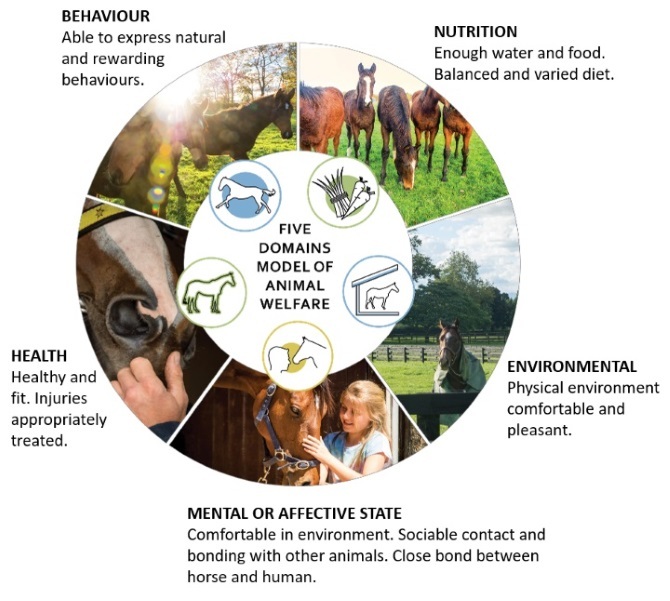 We base our welfare vision for thoroughbred racing on the Five Domains Model of Animal Welfare1. By adopting this model, New Zealand Thoroughbred Racing aims to reduce avoidable negative experiences and ensure our horses enjoy a live worth living. Mellor, D. Updating animal welfare thinking: Moving beyond the “Five Freedoms” towards “a Life Worth Living”. Animals 2016, 6. Undertake detailed data analysis or research to determine the various reasons why horses do not meet their expected potential, and formulate initiatives to reduce identifiable and systemic welfare issues.